Syed, I.A., et al. Post Stroke Remote Complications; A Tertiary Care Experience from a Developing Country. (2017) Int J Neuro Brain Dis 4(1): 1- 4. © 2017 Syed, I.A. This is an Open access article distributed under the terms of Creative Commons Attribution 4.0 International License. Background: Rapidly developing clinical signs of focal (or global) disturbance of cerebral function, lasting more than 24 hours or leading to death, with no apparent cause other than that of vascular origin is termed as stroke. Our study is helpful in providing pattern of complications in different groups of stroke patients. It is also helpful in predicting and managing these complications in patients with stroke in Pakistani population. Material and Methods: Our study was a retrospective cross sectional study. Sample size was calculated using WHO sample size calculator. Sampling technique used in our study was non probability technique. Data was collected by trained medical students and was recorded on computer. The data was analyzed using IBM SPSS version 21. Results: Our study included 84 patients with stroke, which were followed for any complications for atleast 6 months. The different complications were observed in stroke patients. The mean age of study participants was 57.3 ± 12.9. the mean number of patient followup visits was 5 ± 4. Regarding the Remote post stroke complications the the most common complication was insomnia which was present in 24 (28.6%) patients followed by lethargy in 19(22.6%) and muscular spasms in 16(19%). The least common post stroke complication was impotence which was present in only 1(1.2%) patient. Conclusion: Stroke is quite common in Pakistan and post stroke complications should be managed to provide better quality of life to the pateints. In our study the most common complication was insomnia followed by lethargy and muscle spasms. The least common post stroke complication was impotence. The current World Health Organization definition of stroke (introduced in 1970 and still used) is rapidly developing clinical signs of focal (or global) disturbance of cerebral function, lasting more than 24 hours or leading to death, with no apparent cause other than that of vascular origin. There are two types of strokes, the ischemic strokes and the hemorrhagic strokes. The hypertension is the most common modifiable risk factor, other risk factors include cardiovascular disease, smoking, dyslipidemia, diabetes, obesity, inactivity and genetic factors. Excessive stress and alcoholism are also significant risk factors for stroke. Recently some new local risk factors have been studied, prevailing in South Asian countries, which include water-pipe use, parenthesis clarified butter and chewable tobacco. There are different kind of complications that arise after stroke. Some of them arise during hospital stay for example; infection, dysphagia, aphasia, delirium, pneumonia, urinary tract infection, constipation and urinary incontinence. The complications after discharge include depression, anxiety, spasticity, contractures and dementia. The poor nutritional status of the patient may further worsen the complications. The data regarding different post stroke complications is available from different parts of the world but from Pakistan much less data is available. Data from different countries is more focused on individual complications. Our study will help the neurologists and neurosurgeons in their clinical practice involving stroke patients. This study will be helpful in providing pattern of complications in different groups of stroke patients. It will also help in predicting and managing these complications in patients with stroke in Pakistani population. The data can also be compared with that provided by other such international studies. It was a retrospective cross sectional study conducted in neurology department at Liaquat National Hospital and Medical College, Karachi, Pakistan. The sample size was calculated using WHO sample size calculator. The sampling technique used in our study was non probability technique. The data was collected from the records of stroke admissions patients and their follow up was traced for atleast 6 months. The data was collected by trained medical students and was recorded on computer. The inclusion criteria was spontaneous stroke patients according to the definition of WHO, whose records could be traced for atleast 6 months. The exclusion criteria were any acute cerebrovascular event secondary to trauma or infection. In our study frequency of different types of complications were studied that occurred during hospital stay and post discharge. The variables of our study were age, gender, type of stroke, post stroke remote complications i.e headache, lethargy, feet swelling, cough, insomnia, decreased appetite, constipation, urinary incontinence, aggression, joint pain, muscle spasms, impotence, edema, hallucinations and memory problems. Data was recorded and analyzed on IBM SPSS vs 21, frequencies of the categorical variables were calculated. Mean values were calculated for continuous variables. The variables were observed for any associations and relationships using chi square test and independent sample T-test. All ethical considerations were taken during the data collection of study. Our study included 84 patients with stroke, which were followed for any complications for atleast 6 months. The different complications were observed in stroke patients. The mean age of study participants was 57.33 ± 12.98. The mean number of patient followup visits was 5 ± 4. Regarding the type of stroke, 61 (72.6%) had infarct while 23 (27.4%) had hemmorhagic stroke in our study participants (figure 1). 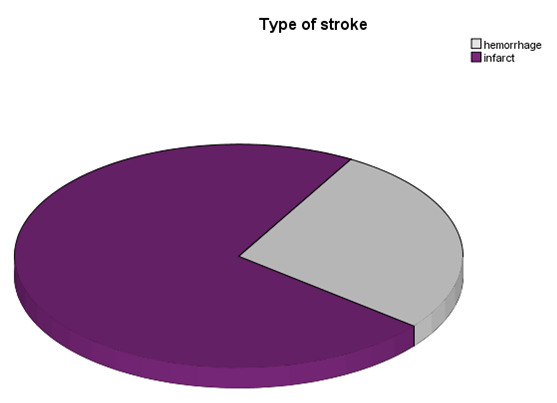 Figure 1: figure showing the percentages of type of stroke among the patients in our setting. Regarding the post stroke complications the most common complication was insomnia which was present in 24 (28.6%) patients followed by lethargy in 19(22.6%) and muscular spasms in 16(19%). The least common post stroke complication was impotence which was present in only 1(1.2%) patient. The descriptive statistics of all post operative complications are given in table 1. Table 1: Table showing the frequencies and percentages of post stroke complications. The post operative complications were also observed for any correlations or associations. We found that feet swelling patients had statistically significantly lower mean age (47.56 ± 9.07) as compared to those in which feet swelling was absent (58.4 ± 12.7) (t =2.428, p = 0.016). Stroke is a neurological condition which is quite common in Pakistan. There are several risk factors for stroke. The stroke risk factors included in the profile are age, systolic blood pressure, the use of antihypertensive therapy, diabetes mellitus, cigarette smoking, prior cardiovascular disease (coronary heart disease, cardiac failure, or intermittent claudication), atrial fibrillation, and left ventricular hypertrophy by electrocardiogram. The attributable risk of stroke for all cardiovascular contributors decreased with age except for atrial fibrillation. elderly are particularly vulnerable to stroke when a trial fibrillation is present. Moderate and high levels of physical activity are associated with reduced risk of total, ischemic, and hemorrhagic strokes. Stroke is associated with more individual domains of disability compared with other conditions and might be considered to be the most common cause of complex disability. Uric acid is a strong risk factor for myocardial infarction and stroke. Dysarthria is a frequent and persisting sequel to stroke and arises from varied lesion locations. Dysarthria is more prevalent in left than in right hemisphere lesions. There is low level evidence for benefits arising from intervention in remote complication of stroke. In a study from Sweden they reported headache as long term complication after stroke. In our study we also reported headache as post stroke complication. In comparison to this Swedish study by Marita Widar, headache was far more common post stroke complication in our setting. A study from Finland reported insomnia in 18.1% patients while in our study we reported insomnia in 28.6% of patients as remote post stroke complication which is higher than that of Finland. In a study by AC Jonsson et al reported decreased appetite as one of the causes of weight loss after stroke. Our study also reports decreased appetite as post stroke complication. Starkistein reported in his study that hallucinations (false perceptions without preserved insight) are distinguishable from hallucinosis (false perceptions with intact insight); both are reffered as secondary psychosis when they occur after stroke. Factors predisposing to hallucinations include lesionsof right temporo-parieto-occipital areas, seizures and subcortical atrophy. Visual hallucinations were also associated with auditory hallucinations, delusions and depression. Also in our study hallucinations were found among 2.4% of the patients. A study from Taiwan reported that Constipation is a common complication after stroke, and showed the incidence was about 30 - 60%. In our study the constipation was found among 9.5% of the patients which is quite low. An international study reported Urinary incontinence following stroke is a common problem affecting more than onethird of acute stroke patients and persisting in up to a quarter at 1 year. Our study reported urinary incotinence among 6% of the patients as remote post stroke complication. A study from South Korea reported aggression as a important post stroke complication. Our study also reported agression among 16.7% of the patients. Muscular spasm which reported in our study was 19.0% which is higher than a international study which reported 11% of the patients with same remote complication. An international study reported sexual dysfunction as post stroke complication. Similary our study also reported impotence among 1.2% of patients which is quite low in comparision to international studies. D T Wade in his study reported 12% patients with significant apahsia at 6 months. While in our study it was only 3.6% which is quite low in comparision to international study. In a study from Finland reported mild dementia among three patients with multi-infarct. Our study also reported dementia/poor memory among 7 patients. It shows dementia is more common in our country as remote post stroke complication. An international study reported post stroke lethargy in their study as unexplored and neglected post stroke condition. They reported severe lethargy in 45% of their patients which is quite higher if compared to our study which was only 22.6%, therefore post stroke lethargy is less frequent remote complication in our part of the world. An international study reported joint pain among 52% of their study population as post stroke remote complication. In comparision to our study, we reported among 17.9% only which is surprisingly much lower than that of international study. A study from Israel reported edema in paretic hand as post stroke remote complication among 37% of their study population which in comparision to our study 3.6% is much higher. Feet swelling is a remote complication of stroke which we are reporting for the first time in medical literature according to the best of our knowledge. We also reported a significant association between feet swelling and age of post stroke patients. The limitations of our study were it was a single centre study, relativily small sample size. We recommend a multicenter study on the same topic in future and with a larger sample size. Stroke is quite common in Pakistan and post stroke complications should be managed to provide better quality of life to the patients. In our study the most common complication was insomnia followed by lethargy and muscle spasms. The least common post stroke complication was impotence. The age of the patients has a significant association with post stroke feet swelling. I as corresponding author on the behalf of all authors, hereby declare that there is No conflict of interest in our research article. 1. Aho, K., Harmsen, P., Hatano, S., et al. Cerebrovascular disease in the community: results of a WHO collaborative study. (1980) Bull World Health Organ 58(1): 113-130. 2. Colledge, N.R, Walker, B.R., Ralston, S.H. Davidson's principles and practice of Medicine. (2010) Churchill Livingstone Elsevier. 3. Kumar, P., Clark, M. Kumar & Clark's Clinical Medicine Eighth Ed. : Saunders Elsevier (2012). 4. Boden-Albala, B., Sacco, R.L. Lifestyle factors and stroke risk: exercise, alcohol, diet, obesity, smoking, drug use, and stress. (2000) Curr Atheroscler Rep 2(2): 160-166. 5. Wasay, M., Khatri, I.A., Kaul, S. Stroke in south Asian countries. (2014) Nat Rev Neurol 10(3): 135-143. 6. FOOD Trial Collaboration. Poor nutritional status on admission predicts poor outcomes after stroke observational data from the food trial. (2003) Stroke 34(6): 1450-1456. 7. Wolf, P.A., D'Agostino, R.B., Belanger, A.J., et al. Probability of stroke: a risk profile from the Framingham Study. (1991) Stroke 22(3): 312-318. 8. Wolf, P.A., Abbott, R.D., Kannel, W.B. Atrial fibrillation as an independent risk factor for stroke: the Framingham Study. (1991) Stroke 22(8): 983-988. 9. Lee, C.D., Folsom, A.R., Blair, S.N. Physical activity and stroke risk a meta-analysis. (2003) Stroke 34(10): 2475-2481. 10. Adamson, J., Beswick, A., Ebrahim, S. Is stroke the most common cause of disability? (2004) J Stroke Cerebrovasc Dis 13(4): 171-177. 11. Bos, M.J., Koudstaal, P.J., Hofman, A., et al. Uric acid is a risk factor for myocardial infarction and stroke the Rotterdam study. (2006) Stroke 37(6): 1503-1507. 12. Widar, M., Samuelsson, L., Karlsson-Tivenius, S., et al. Long-term pain conditions after a stroke. (2002) J Rehabil Med 34(4): 165-170. 13. Leppavuori, A., Pohjasvaara, T., Vataja, R., et al. Insomnia in ischemic stroke patients. (2002) Cerebrovasc Dis 14(2): 90-97. 14. Jonsson, A.C., Lindgren, I., Norrving, B., et al. Weight loss after stroke a population-based study from the lund stroke register. (2008) Stroke 39(3): 918-923. 15. Starkstein, S.E., Robinson, R.G., Berthier, M.L. Post-stroke hallucinatory delusional syndromes. (1992) Cognitive and Behavioral Neurol 5(2): 114-118. 16. Su, Y-J., Zhang, Z-L., Zhang, X-Y., et al. New-onset constipation after stroke: incidence, risk factors and impact on the prognosis of stroke. (2006) 32(4): 300-305. 17. Mehdi, Z., Birns, J., Bhalla, A. Post stroke urinary incontinence. (2013) Int J Clin Prac 67(11): 1128-1137. 18. Kim, J.S., Choi, S., Kwon, S.U., et al. Inability to control anger or aggression after stroke. (2002) Neurology 58(7): 1106-1108. 19. Appelros, P. Prevalence and predictors of pain and fatigue after stroke: a population-based study. (2006) Int J Rehabil Res 29(4): 329-333. 20. Good, D.C. Sexual Dysfunction Following Stroke. (1997) Sexual and Reproductive Neurorehabilitation: Springer 145-167. 21. Kotila, M., Waltimo, O., Niemi, M.L., et al. Dementia after stroke. (1986) Eur Neurol 25(2): 134-140. 22. Vuletić, V., Lezaić, Z., Morović, S. Post-stroke fatigue. (2011) Acta Clin Croat 50(3): 341-344. 23. Sackley, C., Brittle, N., Patel, S., et al. The prevalence of joint contractures, pressure sores, painful shoulder, other pain, falls, and depression in the year after a severely disabling stroke. (2008) Stroke 39(12): 3329-3334. 24. Leibovitz, A., Baumoehl, Y., Roginsky, Y., et al. Edema of the paretic hand in elderly post-stroke nursing patients. (2007) Arch Gerontol Geriatr 44(1): 37-42.